When IRA men Chris and Frank try to buy guns from South African arms dealer Vernon a grudge between two of their henchmen explodes into a long, bloody, painful gunfight. Though not really a comedy, it is very funny. And very violent. But much more care has been taken with realism than is usual in a crime or action movie - ammunition is limited, gunshots painfully loud, bullet wounds genuinely agonising, opponents very difficult to hit at all and even harder to kill. At times it's like a Tom and Jerry cartoon, where every blow to the head, every thrown brick, actually hurts, much of it coming down gratifyingly hard on the head of the loathsome Vernon. In some ways it feels like a natural successor to Wheatley and Jump's A Field In England - similarly confined to a very limited physical space - but whereas that invoked a tradition of English mystical horror, this draws on American crime stories. I saw this when it came out here in the UK based purely on Wheatley's pedigree (Kill List is one of my favourite horror movies of all time, A Field in England still haunts me and High Rise, in spite of some of its flaws, is unlike most things that get made these days). 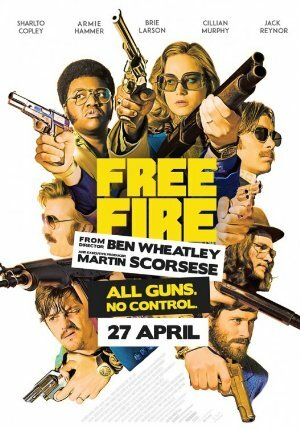 Free Fire's an enjoyable enough film but feels very slight. The following day I'd mostly forgotten about it and now a few weeks removed I'm struggling to remember much of it. I will watch Armie Hammer in most anything and he does steal the show here. A good lesson in directing action cinema though: there is a palpable sense of tension throughout and it is always clear where everyone is in relation to one another during and between the action. It's definitely better than it would have been in the hands of a less confident writer, director and cast. I liked this, basically, though I agree that it seems slight for Wheatley. It was dumb fun and not much more, but it was fun. I kept expecting a big reveal that the woman in the film actually was an FBI agent, but that never came. I was reminded of how I felt watching Hot Fuzz: that I was seeing a loving homage to a whole genre of movies that I don't particularly care for. Still, it's good to see Wheatley get some hopefully higher-profile work. I enjoyed this thoroughly up to the point when the talking stopped and the shooting started. Sadly that must have been roughly the last two thirds of the film. Bit disappointing really. Very much a step up in terms of some big name actors being on board, I hope he has another go and is able to make something a little bit more engaging. It smacked of being too actorly and not having been given enough direction, was particularly unhappy about how difficult it was to work out where they were in relation to each other in the space. I thought Coley was the stand out once the action started, prior to that enjoyed Murphy and pleased to see the Michael Smiley resurgence continue. Huh, I was hoping to see this but it's already gone from theaters here after two weeks. Guess I'll wait until it streams.